Danny and I got an early start while the rest of our crew was sleeping in camp. We headed up to Sassies to work a climb that I had worked a few days before. 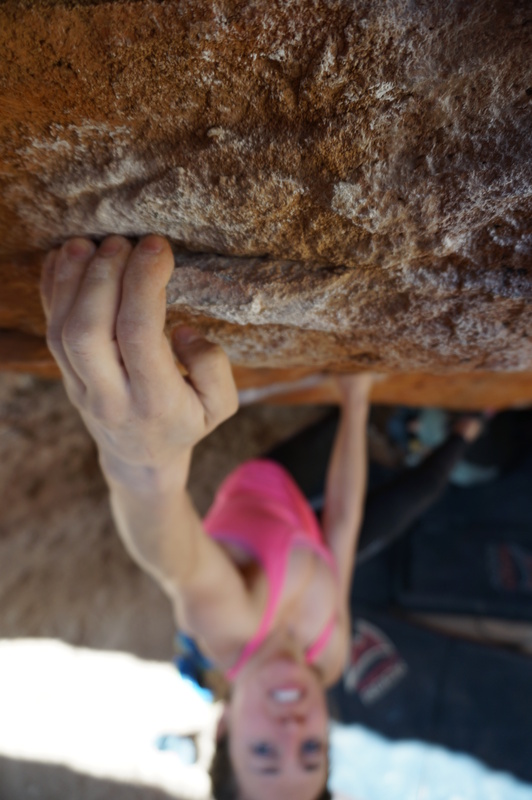 After another hour or so of finessing the beta I sent un petit hueco V8, one of the hardest grades that I’ve sent! I was super psyched and the day was far from over. We returned to camp for a big lunch and then hiked out to Danny’s project with some friends. Danny set up his pads at Macho King V10 and sent in minutes. It was also one of his hardest sends for the trip. As if that wasn’t reason enough to celebrate I then made quick work of Panic Room V7 and Danny walked up No Late Tenders V10 in the dark, guided by headlamps. Basically it was the best day of climbing we’ve both ever had! We celebrated at camp with some local wine and ostrich burgers. Can’t imagine topping that day anytime soon.